Is your budget too tight to deal with lists of required school supplies? The annual Back To School Program helps with the cost of preparing a child for the beginning of the school year. 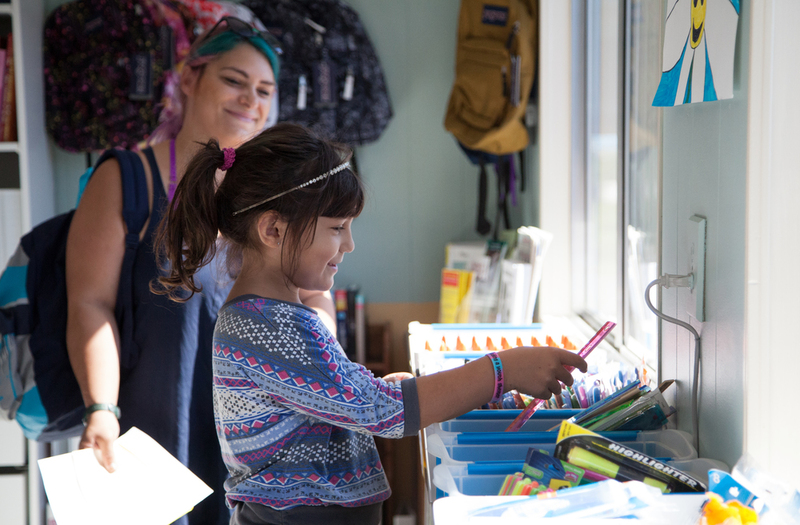 School supplies, back backs, clothing gift certificates, and more are set up in a store-like manner for families to select the items on their lists from school. This program is based on financial need and requires an appointment. How Can You Sign up for our Back to School Program? Families can qualify for the program based on income or a recent circumstance such as job loss, illness, recent move etc.. If you are worried about being able to afford the costs of getting your child ready for school please don't hesitate to call us for an appointment. We are here to help! The Clyde Theatre – Watch a movie in Langley's own Clyde Theater, treat yourself to a snack from the snack bar and drop some change in the Magic Change Jar. All donations are individually matched by The Clyde Theater, Lindsay Communications, and the Island Athletic club. You can triple your money! Webb's Department Store – Did you know if you purchase a high quality backpack at Webb's department store Webb's will donate one to Back To School program? This is a fabulous way to support local business and to make sure kids are ready for school. Island Athletic Club – membership drive - a portion goes to the Back To School Program. Eagles on 525 - Enjoy a homestyle meal at the Eagles on 525 (insert schedule/time) and all proceeds and tips go to Back To School program. Yum! There are several opportunities to help collect and sort items in August. Reach us at 221-6808 ext 4321 OR please fill out the form above and title the subject line "BTS Volunteer." Host and promote a supply drive of your own! We'll supply the drive box, and you and your neighborhood community/office-mates/yoga class can fill the box to overflowing! Challenge your friends to a drive-off! Please click DONATE and you will be directed to the Click and Pledge website to make your donation. All donations to the Readiness To Learn Foundation are tax deductible. When your donation has been processed you will receive an emailed receipt for your tax purposes.